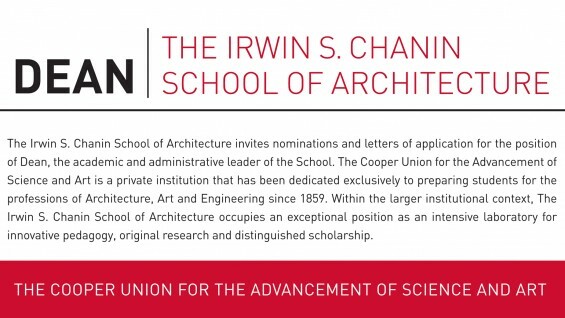 The mission of the Irwin S. Chanin School of Architecture is to provide its students with the highest standard of professional education. Fundamental to this mission is the continued cultivation of an environment where creative exploration and freedom of thought are given a place to flourish, where individual gifts and the means of expression lead to both a mastery of form and to the discovery of the vast realm and pleasure of architectural creation. In fostering a context of intellectual rigor and inquiry, the programs of the School of Architecture emphasize a broad spectrum of social and cultural concerns, vital to the understanding of the role of architecture at the present time. The School has consistently been at the leading edge of pedagogical invention in design and theory since its inception, with an outstanding level of dedication and commitment on the part of students and faculty alike. The School of Architecture is currently comprised of 45 full, proportional-time and adjunct faculty, internationally recognized practicing professionals and scholars. The student body includes 145 undergraduates and 10 graduate students, from every corner of the US and from dozens of countries around the world. Students are offered either a five-year degree program leading to the Bachelor of Architecture or a three semester, post-professional program leading to the Master of Architecture II degree, with emphasis in one of three areas of concentration. Further research opportunities exist within the Institute of Sustainable Design. The School of Architecture’s location in downtown New York City is an essential part of its vibrant nature, offering direct exposure to a rich urban and architectural history and a dynamic metropolis unparalleled in its stimulation and opportunities. The School of Architecture seeks for the position of Dean an individual who can provide the leadership necessary to carry forward its distinguished standard of excellence. It is the Dean's role to affirm the mission of the School of Architecture, while overseeing the continued development of its programs and the evolution of its curriculum. The Cooper Union currently faces significant challenges, which in turn provide exceptional opportunities to reaffirm and advance the School's strengths and values. The Dean will champion the School’s interests, both within the Institution and in the broader professional and academic realms. Candidates must demonstrate a significant contribution to the culture of architecture, through their work in education, practice, and/or history and theory. A professional degree in architecture, regardless of current professional or academic position, is a requirement of candidacy.